The MULTI Card is free and required for residents to participate in activities offered by the City. 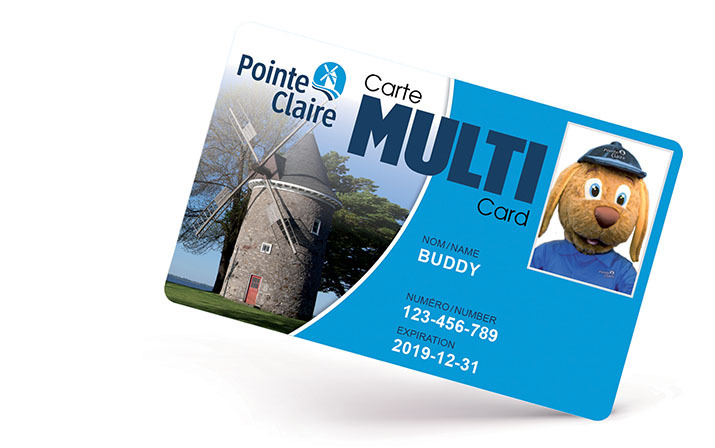 Renew your MULTI Card now if it will expire in the next 3 months. Residents can get their MULTI Card at one of the following locations during opening hours. When first applying for the card, you must provide proof of identity and proof of residence with the names and addresses of each family member. When renewing, you must present the card and a proof of residence. There is no minimum age to obtain the card, which is required the first time a child registers for an activity. Children age 6 or over must be present when the card is issued because their photograph will be taken on site. The charge for replacing a lost or stolen Multi Card is $4. Non-residents can apply for a different card, which is required for the Library, weight room and recreational swimming. Proofs of identity for persons age 12 or up must include a photo (this does not apply to seniors). Photocopies are not accepted as proofs of identity or residence. When a card is first issued for a child, a birth certificate must be provided. Non-residents must obtain a LUDIK number to register for City activities. 1. Send a request to aquatique@pointe-claire.ca, an online request or call 514-630-1200.